Setting reasonably attainable annual and long-term incentive targets has become increasingly difficult for companies due largely to external factors. For similar reasons, companies have increasingly turned to performance ranges for communicating external earnings guidance to shareholders. As a result of the externalities influencing budgeting and forecasting accuracy, companies are considering the use of a “target range” rather than a specific “point” target for incentive plans. Target ranges provide an opportunity to earn/fund target incentives if performance is between the lower and upper range boundaries. Target ranges may provide additional benefits: alignment with external guidance structures, reduced risk for adverse performance behaviors around target, reduced impact of externalities on target awards/funding achievement, and greater pay/performance risk outside of the range (for adverse outcomes or exceptional performance). The width of a target range needs to be carefully tailored to the chosen metric. ensuring the rigorous nature of incentive plans (57%). 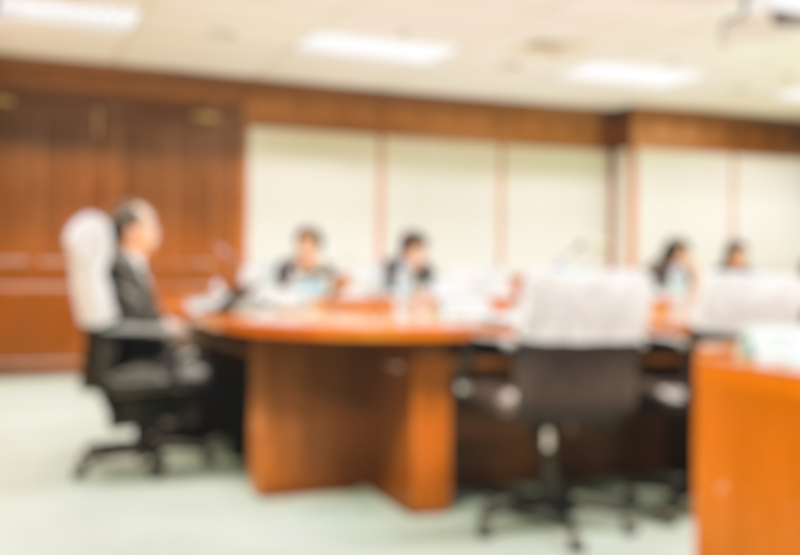 Although the survey is a few years old, our experience tells us this remains a hot issue in Boardrooms today. Setting annual and long-term performance targets continues to be challenging, particularly given uncertainties in the market related to interest rates, commodity prices, foreign exchange, and the many other underlying assumptions involved in setting a business plan and incentive goals. 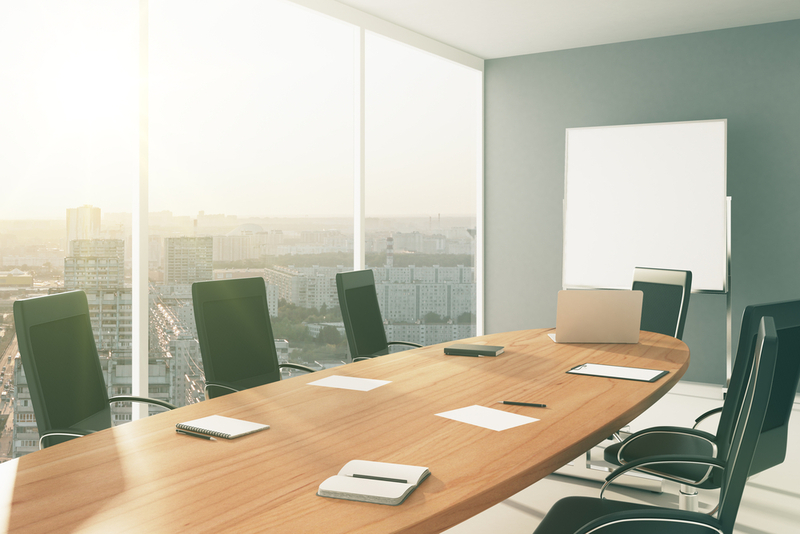 The challenge for Boards in setting goals is underscored by the difficulty management experiences in establishing performance expectations for shareholders and the research analyst community. In their research on management earnings forecasts at companies covered by the First Call Company Issued Guidelines database, Ciconte, Kirk, and Tucker document the increased prevalence of earnings range estimates with upper and lower bounds and the decreased use of earnings point forecasts.2 Point forecasts are synonymous with discrete performance targets for incentive compensation. But as Ciconte et al demonstrate, the use of point forecasts has decreased to 11.3% of cases in 2010 while prevalence of range forecasts has increased to 87.5%; in 1996, the use of point forecasts occurred in 30.0% of cases in contrast to range forecasts used by 38.2% of companies. Given all these unknowns and the clear trend toward using ranges for financial performance guidance to shareholders, it is not surprising we find companies looking for alternative approaches to traditional performance goal setting. A number of companies have opted to establish a “target range” in their incentive plans to acknowledge the imperfections in setting a single fixed target. This is consistent with the practice of providing range guidance to the financial community. What is a "target range?" 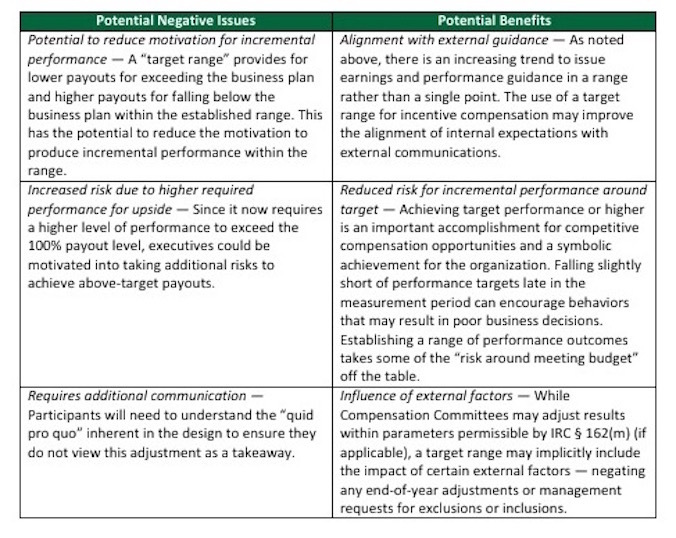 A “target range” establishes a reasonable range around the business plan to pay or fund incentive compensation at the target award level rather than establishing a single, fixed performance target. It is, in essence, a compromise by which both shareholders and management give up some gains around a reasonable set of outcomes and acknowledge the imperfection in establishing performance expectations to shareholders, analysts, and employees. For example, a company could establish a range around a target net income goal of ±3%, which implies that the slope of the incentive payout line is flat between 97% and 103% of the target goal. 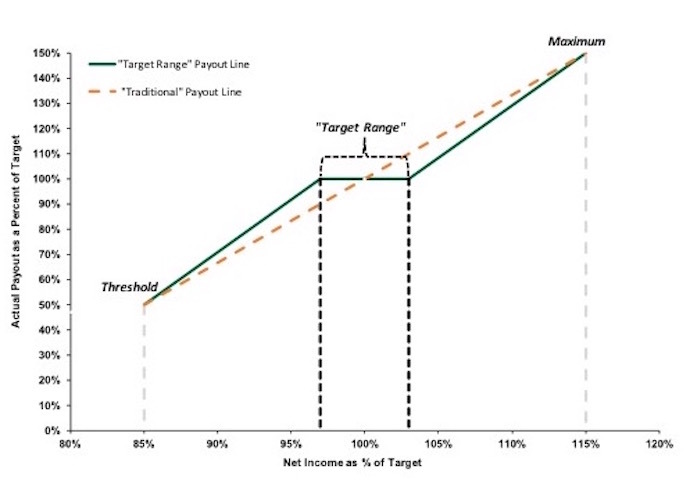 This results in the same payout (100% of target) for all outcomes across that segment of the curve (see “Target Range” bracket in graph below). Net income performance below the lower boundary of the target range results in declining award payouts to the threshold level of performance, while performance above the upper boundary of the range results in incrementally higher awards up to the maximum payout. The overall performance range (upper and lower performance boundaries at which maximum and threshold incentive awards are paid) will likely vary depending upon the confidence/uncertainty level associated with the performance metric. The use of the “target range” increases the pay/performance slope beyond the lower and upper range boundaries if no adjustments are made to the threshold and maximum performance levels. Although target ranges are not yet widely used in the market, we are finding more companies discussing the benefits of this approach every year. Practices vary by company, but generally reflect a range of 1% to 5% from the lower to upper boundary in the range. Is it consistent with the guidance you are providing to shareholders for similar performance metrics? What is the appropriate width of the boundaries (number of standard deviations) to achieve a 70% to 80% probability of achievement? Is the range still acceptable on an absolute dollar basis? Depending on the metric, a ±5% spread may be too wide or too narrow. The “target range” is typically employed to give management and the Compensation Committee a reasonable margin for error when setting targets without significantly increasing the probability of hitting or missing the targets. The “target range” concept can be a useful feature to increase flexibility in the plan design, recognize the volatility of potential results, and understand the numerous assumptions involved in creating the business plan while maintaining compliance with IRC § 162(m) deductibility. 1. NYSE Governance Services. 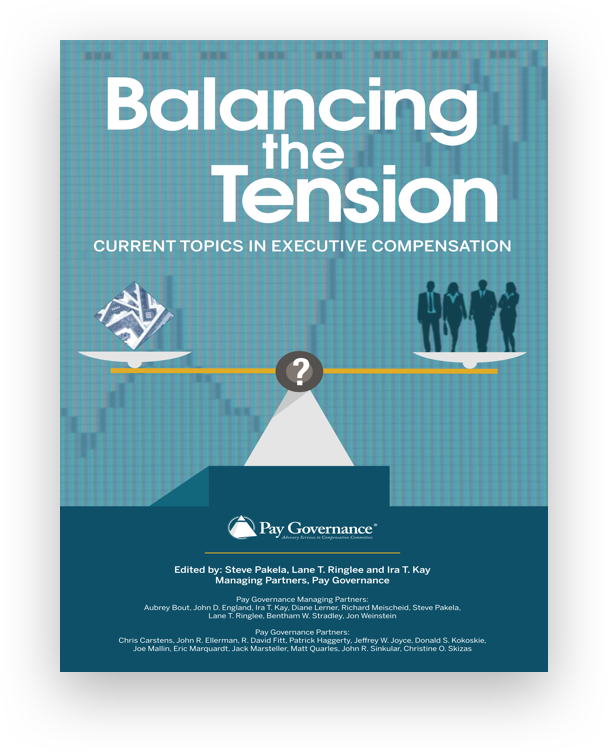 “Executive Compensation: A 2013 Opinion Survey of Compensation Committee Members.” Pay Governance. 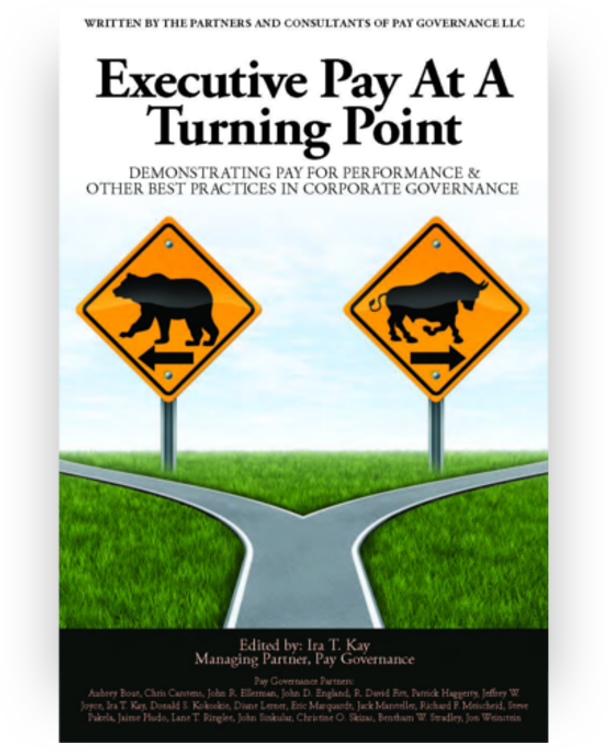 2013. http://paygovernance.com/wp-content/uploads/2013/11/Exec-Comp-White-Paper-B-110413-final.pdf. 2. William Ciconte III, et al. “Does the midpoint of range earnings forecasts represent managers’ expectations?” Review of Accounting Studies. November 24, 2013. http://link.springer.com/article/10.1007/s11142-013-9259-2. General questions about this Viewpoint can be directed to Lane Ringlee, Chris Brindisi, or Peter Ringlee by email at: lane.ringlee@paygovernance.com, chris.brindisi@paygovernance.com, or peter.ringlee@paygovernance.com.